On Monday we were back on our bikes after cancelling the last couple of weeks due to illness. Everyone rode further than previously and confidence is growing. While after-school bike club is for our Grade 5 and 6 students, all of our students have been enjoying riding bikes and scooters around the grounds at recesses. If your child would like to keep their own bike or scooter at school they are welcome, but will also need to bring a helmet. Bikes and scooters are stored in the shed. 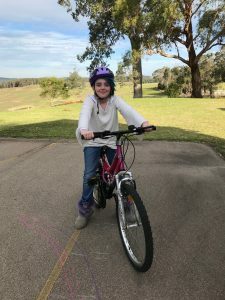 We are very appreciative of the Bairnsdale Workways who were happy to supply a bicycle for our Bike Club.